Autumn - Winter 2016 part 3. Her show for autumn was pretty hotly anticipated and Danielle showed the same spirit of exploration and vision that gives her youthful label it's punchy identity. The presentation was bustling with a lot of interest from editors and photographers in the collection and as a designer who has formerly carried NEWGEN sponsorship from the British Fashion Council there is a certain amount of expectation on Danielle on both sides of the Celtic Sea as to what will be coming next. Danielle was on hand to give her time to answer questions from us journalists and insights into her moods and inspirations. Colour is s strong theme in the collection with a series of red's, white, grey and black jazzed up with touched of pale light blue and green. The palette feels vibrant and not confused or "too much". It aptly represents the mood and energy that Danielle is trying to capture here in the collection. This is a theme continuing from Danielle's collections of recent seasons where she focused around perhaps 4 or 5 main colours in her presentation and had a lot of fun playing with different designs to apply them to. This is a wardrobe for an international girl, she can be an urban warrior or perhaps a traveler in far flung lands or even a city dweller at work or at play. Wherever she heads she's taking a strong eye for detail with her and Danielle's tailoring presents a series of looks that are for the bold who like to play with the idea of conformity. There's a strong sense of millenial college/post college girl here and the fashion tribe this appeals to is particularly broad. It's cool and it's casual and seems to be a collection that has a voice of it's own. Outsize shirts where adapted with slashes at the inner side of the elbow and cropped high above the waist with draw string detail bringing a sport note into the looks. Fabric was universally light with sheer cottons and synthetics coordinating with jackets, skirts in different texture fabric. There was also a faint echo of combat trousers and the 1990's military style casual that came into the collection paring an androgynous look with other more feminine elements such as the dress below to the centre which you could frankly describe as pretty. Complete with ribbon detail in applique across the surface, this piece could be worn in both casual and potentially slightly more formal settings such as a dinner or a black tie party combined with a jacket. In the black shirt and trouser combination below there are also echos of the AW15 collection that played with hints of first nations traditional tribal dress in notions of form and style. The neckerchief also gives a hint of the Wild West but the look is resolutely in the present. The colour strips that decorated the room emphasised the mood of the collection reflecting the bold tones of harmony and contrast that Danielle aims to compose with this collection. There's attention to feel and resonance through colour and texture and style here. Shapes that appear to be deconstructed have a way to be wrapped naturally round the figure emphasising a practical utilitarian attention to design that carries through the urban feel This is a juxtaposition ot one of her inspirations, historical portraits of Queens, in this case Isabel de Valois, 3rd wife of King Philip II of Spain. This is also an area, Royal portraits of the mid 2nd millennia, that I have found an inspiration also myself. Given her pan-european experience we're lucky to have Danielle Showing in London and each season she brings a special energy to the collections she brings out. Her offering will always be something dynamic that will surprise to an extent but for her followers there's a reassuring continuity of the energy that sets a challenge to order and convention and forges it's own style. Danielle's woman is one of great resilience and strength leaping forward into the future. Huishan creates what is known in some circles as Haute Ready to Wear, sumptuous in their detail and always beautiful they define a contemporary vein of modern luxury within the current fashion scene internationally and it's easy to see why his designs turn heads in Hollywood and have also earned him the coveted British Fashion Council Fashion Trust Prize. His label established four years ago is one tipped for the future amongst the bright young names at London Fashion Week. Huishan's training in the industry indicates his leaning towards the higher end of Ready to Wear with six months working in the Atelier at Dior during a year with the House in Paris as part of his degree at Central Saint Martin's in London. This opportunity has evidently been a key part of Huishan's growth and formation as a designer but also a reminder of the formidable nascent talent that he already was seen to posses during his studies. Within the industry he has many influential eyes watching him and he so far is living up to the promise and expectation that where placed upon him at such a young age. Gilded embroidery on print reminiscent of fine china gave way to statement pieces in plain colours with bold hem detail above to the left offered a coat and a day or evening piece that would work well for many clients encapsulating the youthful, playful energy that Huishan seeks to bring out in his work with the Haute Ready to Wear model of refinement and control. Huishan is clearly brimming with ideas and showed 3-4 pieces generally based around one of his keep collection themes. Not confused in it's outlook this collection is showing vignettes of different style themes and with a truly global client base Autumn in the Northern hemisphere looks a little different in the south. The floral looks played a strong part in the offering in a two pieces ankle length dress, trouser suit or high collar sleeveless dress. Again this is very transferable luxury giving clients looks that will suit a formal wear dress code and look fantastic at a lunch in Mayfair or Los Angeles or at a private party in the country. To the right a blouse and skirt suit works asymmetric themes with a elongated right sided blouse and out-size pearls roped around the waist to create an elegant belt alternative. There is an essential chic to these looks, Chic is a word to be used sparingly in fashion but for Husihan this is very apt. His collections are a true statement in luxury fashion and we waited in much anticipation for his collection at the Connaught for Autumn - Winter 2016 and with clients such as Gwyneth Paltrow, Helen Mirren, Suki Waterhouse, Keira Knightly and Sarah Jessica Parker very satisfied with his designs on the Red carpet the future looks very exciting indeed. Fittingly the collection contained mostly occasion wear pieces and looks for those days when you want to dress your absolute best, which in honesty should really be every day. The blue flower design above to the left adorned the invites to the show. Intricate blue flower print overlaid with cross cross gold silk lace work demanded closer inspection from the fashion audience assembled. Sitting lightly on the figure these looks are headline statements in taste and you can see that Huishan is making a strong case for his own brand of modern refinement. Geometry also plays a steady influence through the collections creating an ordered composition that eases the eye into the elegance of form. To a fashion followers eye the results are breathtaking and as I stood alongside buyers from some of the most prestigious Department stores in New York and other photographers and writers taking in the images it was clear to see that Huishan is developing and his strength as a designer is growing. There is a great deal of sophistication here but the elements of fun and play are never lost. Centre above the black suit with fine white floral embroidered detail looks a like Chrissie Hynde meets Haute Couture with a soft finish of feathers at the front. You have the classic stylish expression and then the play of the white feathers next to it on the floor length dress dip-hemmed at the midi line. The two looks to the right to me had the touch of Dior or possibly CHANEL about them. Quilted black velvet jackets with pearls accentuating the jacquard design took the bomber jacket into a new sphere of luxury mating it with a Ball - worthy dress. The knee length alternative next to it also showed promise as a look at that could be worn mid winter to the most glamourous of occasions complete with pearls again sitting on the waist. I couldn't resist dropping in another shot of this look below from the front showing a little more detail to hopefully give an impression of how soft this velvet looks. Feathers brought a soft touch to more pieces later on in the collection with a stunning floor length look above to the left in sheer fabric adorned with a black velvet ribbon tie at the waist. Coolly elegant this will look fantastic on the Red Carpet for Huishan's high profile clients and will also be lively to make a lot of private clients looking for a special piece for the winter party season. It's also light enough to be worn across seasons should you chose. Above some extra full length images of pieces from the collection. Above to the left feathers are accompanied with fur sitting on top of the same sheer silk fabric. Front fastening of the jacket with pearls for buttons adds the subtle nuance of luxury style that Huishan's clients love him for. This is high fashion chic but still feels fresh and for the current generation. Complete with hood Inuit style you could easily wear this on the coldest day in New York, Toronto or St Petersburg and still keep warm on your way to a party or even to work. It's a look full of character and demonstrates his versatility in working with many different fabrics to create a complete luxury collection. Below to the left and show in more details is a silk dress with trousers that feature again some of Huishan's signature floral print work for this collection. It's light and delicate and wouldn't look out f place in some of the Haute Couture collections that you see in Paris. I know I return to this theme again when talking about Huishan but I have a feeling that one day his path may lead to Paris again. Below to the left are two beautiful dresses with laser cut four leaf clover detail from the earlier part of the collection showing a subtle graduated rainbow through the design and a favourite of Sarah Jessica Parker. Huishan's soft playful elegance is at work here and as always the pieces are comfortable enough to play the night away in. The Good Captain Temperley took us with her on a fashion voyage on the High Seas for Winter 2016. Alice's shows are one of the most keenly anticipated of London Fashion Week and with a set composed no less of a Pirate ship complete with suggestions mystery and theatre with smoke and light adorning the rigging we were beckoned by mermaids, nymphs, pirates and Sailors of the Royal Navy to watch a fashion show on a moonlit night when they stepped ashore somewhere in the world. I may be getting a bit poetic there but Alice and her team pulled out all the stops welcome us into the spirit of the collection and it did make a difference as the mind is fully engaged ready for seeing the creations that she sent our way. I was lovely to be able to subsequently meet her at her charity car boot sale in Brewer Street in the Spring for the Women for Women charity, have a proper chat and thank her for such a great show. The naval theme and lose play on pirates of the Caribbean proved fertile ground for creation with Alice. Collars and ruffles made a leap forward in time to the 21st century catwalk providing a plethora of choice for the buyers, clients, stylists and press assembled in the audience. Embroidery was big and in bold colour covering capes playfully adapted from 18th century masculine lines. The result was a flurry of very stylish English Roses parading before us on the catwalk making confident statement whether the looks tended towards the masculine or the feminine. Above to the left an early look of the collection was a fantasy of lace and an embroidery in white tied with a black ribbon high waisted sash, the monochrome tones allowed the eye to concentrate on the detailed layers of pin tucked pleats and embroidered cuffs embody the feel of romance that Alice brings for the Winter 2016 collection. The billowing winds in the sales of the spice island traders lend their breath to add volume to the dresses made of sumptuous volumes of material, the power of seduction always lying firmly in the grasp of the woman as she waled before the audience holding the gaze of the assembled crowd. Alice found huge depth and scope in her subject with a fan factor ever present in the collection. She describes the theme of collection as having a touch of Jimi Hendrix. The Sirens are the rock chicks of the high seas, but no groupies, these ones are in charge and a spirit of rebellion and defiance walks with them. Amongst the rich embroidery military fine needlecord and frogging embroidery on the surface of dresses, coats and capes provide ample opportunity to accentuate the female figure by reinventing it's use. It's a swashbuckling approach to doing something a little differently and looks completely modern and fresh. Rich cinnamon and other spices from the trade routes that Alice's pirates plundered lend there influence to the collection colour scheme. Hendrix also brought to mind briefly gins, spirits and the liqour trade that was one of Britain exports during the time of pirates. The pirates are romantic lovelorn figures in the genesis of Alice's collection and while they may be raiding the ships of the Spice routes, it's the Sirens holding their affections who have the upper hand. In a 'Borrowed from the Boyfriend' moment they are stride out in their clothes re-worked for a modern age. As Alice client base can attest (and I am one them) she has the strong ability to turn a traditional theme into something fresh and new that feels completely now. The richly coloured embroidery covering the dresses and coats speak of tales of love and romance with the stitches and prints emulating the tattoos that the pirates gathered as they traveled the high seas in search of adventure, and recalling love. The dresses above feature applique embroidery and combine both floral and animal print design echoing perhaps the experience of travel and nature that the pirates encountered and the wild shores that they found their nymphs and sirens on. Tigers from the lands that the spices originated in inhabit the silks, waiting to jump out at the audience viewing the dress. Made of the lightest fabrics they sit delicately on the figure and are cut in free flowing form to allow movement and ease as you would expect from such an experienced hand. These are the lightest most delicate pieces encapsulating a boundless feminine energy and having met Alice herself I feel part of her energy and spirit is bound into these looks. As the collection progressed to pieces that where overtly evening wear in style, the 18th century men's frock coat was adapted to a beautiful embroidered ankle length women's coat giving off the most feminine vibe. In light baby blush pink with ribbon embroidered birds and flowers at the cuffs and running from the shoulder to waist crossing the back of the garment, this was one of the defining pieces of the collection. With frilled collar and large ribbon bow neck in the masculine tradition, this outfit like much of the collection conveys the wearers sharp eye for style. It's playful dandy-like look sitting above a delicately frog embroidered light silk dress giving the outfit the softest feminine appearance imaginable. Sequins and beaded applique work add a magical touch to the bodice of the light blue dress above with ruffles sleeves borrowed from the pirates wardrobe. Floating as if suspended in water this siren could easily be walking the red carpet holding the attention of the press rather than calling pirates to their doom. Wisp-like in white the next dress is another diaphanous fairy-tale piece, a fountain feminine charm and delicacy utilising light ribbon embroidery, layered tulle and sheer mesh embroidery. The ruffled lace cuffs are echoed in the lengths of the skirt and this would also make a possible bridal dress for those perhaps marrying on an island in the Caribbean this winter inhabited once by these nymphs and pirates. An new name on the show schedule for Autumn-Winter 2016 was Sid Neigum. Hailing from Alberta in Canada and with a degree from the New York Fashion Institute of technology his presentation at the ICA felt also like one the best parties anyone had been to during London Fashion Week. While it didn't hit the wider press big time it was one of the fashion shows that everyone was talking about the next day. Kind of like a New York Club landing on The Mall for a night. And why not. Hot footing it across St James' after Alice Temperley's show it was well worth having this slotted in as my fifth show of the day. It's always great to discover new designers and when one has a contemporary cool about him that seems to be a look that's pretty universal is always fun. Neigum is primarily working with long lines for Autumn-Winter 2016. Draped across the figure and resting gently round the shoulders he presented a series of looks carefully composed to show an essential direction that he wished to convey. The colour scheme worked around three essential colours of black, white and camel presenting a bold almost stark look drawing attention to style and detail. Above to the left a white dress with nehru collar sits underneath a sleeveless jacket with out sized lapels running down to the hem. Leaving the dress underneath partly exposed creates a monochrome total look matched with some seriously delightful must-have boots. Deep pockets emphasise both practicality and also illustrate the comfort factor that runs through the collection. Centre above the camel coat dress deconstructs the traditional tailoring elements of the jacket and is also soft to the touch. This isn't just an exercise in aesthetics here the designers is really looking to create a piece that has lasting comfort value too. The open seam front of the dress at the knees shows where the designer is conscious of creating clothes that move in harmony as the joints of the body flex. Above to the right large knit drapes the figure in several layers in an out-size cape coat ensuring warmth for the wearer and creating a look that will be at home amongst an arty crowd as well as on city professionals across the globe. Burberry images with kind permission of Burberry. commercial operations in fashion flexes it's muscles. 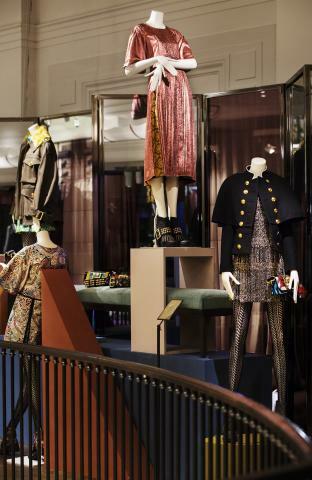 Fashion is one of key export industries and Burberry are there as one of our leading trade ambassadors flying the flag for global trade as well as setting the tone for next season. Christopher's leadership is also keenly watched as both designer and businessman and it takes a steady hand to keep up the pace designing multiple collections each year as well as looking to needs of international markets and future direction of the brand. Burberry is part of our textile heritage, like several other UK labels showing, but it's the one with by far the greatest international exposure and audience the shows each season carry a tremendous economic weight and in past seasons I've seen politicians such as Tessa Jowell attending and on of our two best known fashion ambassadors Samantha Cameron, the other being Catherine, Duchess of Cambridge. This season Burberry changed the show format from the previous catwalk structure of tiered galleries stacked about 8 rows high to the a much more intimate twisting, almost club like layout with the models snaking a walk around banks of seats only a couple of tiers high. It gave the intimacy that the clothes deserve but main talking point this season was the naming of the collection itself as the "February 2016 collection" Chris was freeing himself from the constraints of seasonal fashion as has been the mainstay of ready to wear in over 50 years. 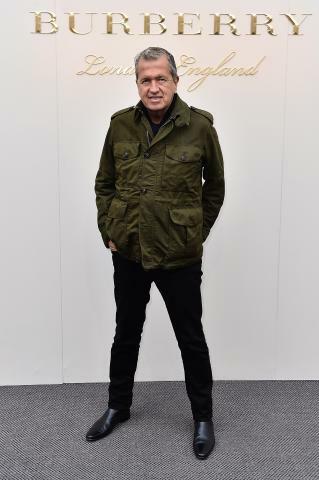 He also introduced a larger than before number of male models onto the catwalk heralding next seasons dual men's and women's collection to show in September and be instantly available to buy. The times are a changing in fashion with the debate that started in autumn 2015 about season collections still very much in progress. Rock and Roll. He's prepared to rip up the rules and do it his own way and this is often the way to achieve a considerable degree of success. 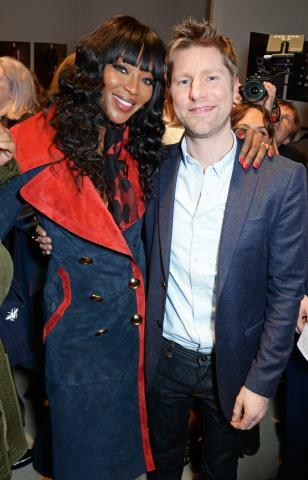 No amount of speculation could turn away the Burberry faithful among the celebrity patrons though and Donna Air, Riley Keogh, Naomi Campbell and Ellie Goulding where among the guests who joined Christopher before or after the show to toast the new collection. There's more than a note of Bohemian eclecticism in this collection with a hippy off-beat vibe that has the confidence to match plaid and sports jackets and pressed trousers into one look. The pieces themselves are all of the highest quality and you can see quickly the mark of Burberry's signature high quality precision tailoring flying the flag for Made in Britain. I covered Burberry last autumn for Country and Townhouse Magazine, which the team liked - see link here - and a key message from the Burberry story that I wanted to get across was the dedication to producing in the UK. Burberry is what is known as a lateral operation in the industry, with design, manufacturing, press, media and retail all covered by the House itself. This is the key that enables it to have the flexibility to change to a new production and retail format and structure in a way that may not be possible for every designer. 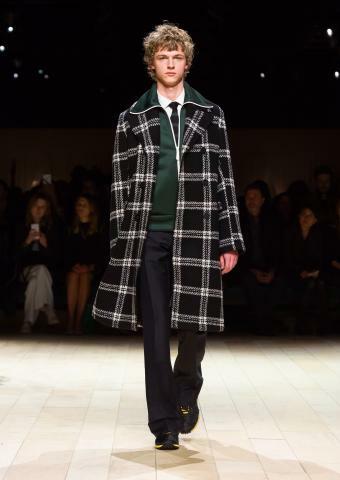 But this is a case of "if the shoe fits..." for Burberry and it's full steam ahead into a new future. 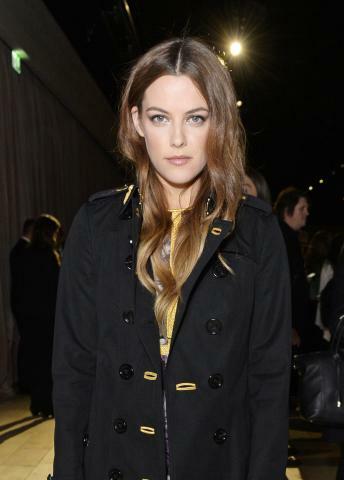 This season the Burberry Raincoat appeared in several new forms with navy wool above to the left trimmed internally with hints of the traditional Burberry cheque and also breaking into the new sphere of tartan plaid with a number of different permutations of fabric weave as you can see above. These are garments that have a good chance of pleasing the Burberry faithful as well as having the hall mark quality and style to attract new clients. The mid thigh party dresses with shimmer as you shimmy are also a strong feature in this collection. They have broad appeal and are, as Chris is looking to achieve, items that have trans seasonal appeal quite fitting for collections that will be ordered in a number of climates in February 2016. Colour played a strong hand in this seasons offering with Bright and Bold watchwords for his statement pieces. Above left was one of the most eye catching tartan pieces in cream-white and berry red with it's out-sized lapels recalling the classic Burberry trench. This coat, like many from the collection, will be heading to the wishlists (ahem) and has the classic comfortable and elegant tailoring style that we love. It's another look that is adaptable to pair with one of the party dresses from the collection embellished with applique embroidery, sequins and beads. It shows the power of contrasting tone and texture that can be achieved. 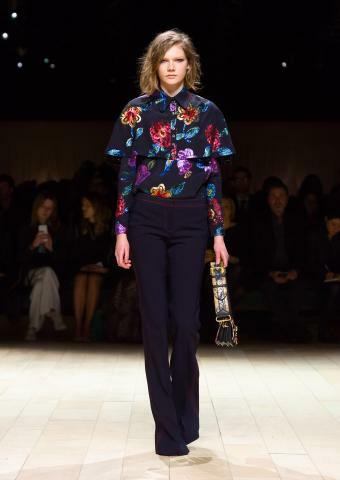 Next to the right the formal lines of a navy blue military styled coat sit above a burst of floral colour presenting a juxtaposition of the conventions of floral feminine and masculine lines. But why shouldn't they be as one? The style presents itself as an elegant total look and that you could wear just about anywhere. Floral embroidery features in two further looks above in a blouse showing caped features in a new stylistic twist and in the panels of the bohemian ankle length dress to the right. Like many looks here in this collection it's a very tempting piece to imagine yourself wearing, dancing and enjoying being in. Christopher had plenty of fun with the idea of jewelled party dresses this season, taking their cue perhaps from impressionist art. The party looks to be carrying on for Burberry and it will be fascinating to see how many people follow their lead in adopting a new show season structure. Swathed in romance the collection offers a range of day and evening pieces that will live long in your collection should you wish. Centre above in triptych one of the most opulent looks of the collection was a crystal beaded dress superbly cut so that it sat close to the figure at the upper area and descended into a fluted skirt swinging lightly below the knees. Tied at the nape with a black bowed ribbon descending down the length of the dress coordinating with ankle boots this is one of the chicest monochrome looks that you will come across this season. There's a shimmer of the sea as she moves across the floor. The mermaid style reaches further above to the right with a tulle layered skirt embroidered and ribboned echoing the waves of the sea as well as the flourishes of 18th century style. Like a fantasia on ribbon this stunning evening dress attracted much attention at the show but feels contemporary and modern. You could go out clubbing in it or take it to evening drinks straight from the catwalk, there's a huge fun factor involved too just as there should be in high fashion that we want to wear. The run through finale was one of the most talked about at London Fashion Week that I came across and the collection looked spectacular with many looks floating onto the wish-lists of the audience. Around her theme Alice and her sirens found many places to explore. They took us on the greatest fashion journey and I'm longing for a seaside adventure. Below left is a little picture of the gallion that sailed on after the show under a moonlit sky. Pirates where sometimes the stuff of scary legends but this was a ship of bold fairytale dreams. A lot of Neigum's work appears to be inspired by folds and the shapes that are created by doing this. Sid is frankly cool and he's one of the most watched emerging designers of the moment on both sides of the atlantic. His dedication to following the golden ratio of 1 x 1.618 has created a frame for him to work within that offers a base for further exploration. Experimentation with texture comes in several forms including crinkled cotton modal used for jump suits and long dresses that have a similar property to stretch-silk. Tree fibre and varying elastine blends emphasised Neigum's desire to work with the most sophisticated elements available to him to create a thoroughly contemporary capsule wardrobe with it's own identity. The jump suit above centre with it's deep pockets has a hint of 1980's New York about it and you can see where Sid, an inhabitant of the New York art world may have absorbed some of his inspiration from. The dress above to the far right with it's ruffled collar adds a theatrical touch of whimsy to this floor length piece that you could wear to black tie formal occasions, drinks or dinner parties or perhaps to work in an arts or fashion environment. For a first step onto the London Fashion Week catwalk this show covered all the key bases of coats, cape-wraps, dresses and jumpsuits providing ample choice for piece looking to add some Neigum to their wardrobe for the Autumn. He's fresh and brimming with ideas so let's see where this journey will take him.